In protecting your home from the elements, your shingle roof takes a lot of abuse in winter. As a homeowners, you can help your roof perform best with a few preventative measures. Roof care is more important in around winter than at any other time of year. This is largely due to the threat of ice dams, which can wreak havoc on your roof and attic and potentially cause major, costly damage. 1. Inspect the roof & attic. While it may sound like common sense, it’s important to perform a regular inspection of your roof. Look for curled, cracked, loose or missing shingles. Check flashings and other penetrations, including around chimneys and exhaust vents. Be sure these areas are properly sealed against the weather. If anything doesn’t “look right”, contact a roofing contractor for a professional inspection. Look in your attic, as well as interior walls, for evidence of current or prior leaks. Roof leaks will often reveal themselves as stains on your ceilings, or as stains and wet areas in your attic. However, not all roofing problems are obvious, and the absence of drafts or leaks doesn’t necessarily mean your roof is structurally sound. Check your roof for any leaves, twigs or miscellaneous debris. These materials tend to collect in concentrated areas, where they may gather water or moisture which can break down the shingles on your roof. Roof debris concentrated in valleys also prevents water from properly flowing away from your roof and into your roof’s gutter system. Don’t forget to trim your trees. If there are any limbs or branches hanging over your roof (or growing close), have them removed. Falling branches can lead to expensive roofing repairs. 3. Check the gutters and downspouts. Keeping your gutters clear is important in allowing snow melt to properly drain from your roof and into the downspouts. In the winter, the weight of ice buildup from clogged gutters can cause significant damage. If they are clogged, gutters and downspouts can’t channel water and snowmelt away from your home which can lead to serious damage. Ice dams can form from the buildup of ice and snow inside gutters and along roof ridges. When a dam forms, water may pool up behind it, where it can seep into the interior of your home. Ice dams can cause significant damage not just to the surface but to the entire roofing structure. While there’s no 100% effective way to eliminate ice dams, they can be minimized. Proper roof insulation, as well as a good attic ventilation system, are key elements in an effective defense against ice dams. Proper attic ventilation means a consistent & efficient flow of cool, dry air through your attic: intake through eave and soffit vents, and exhaust through vents in the gables, deck or ridge. Typically, a correctly sized exhaust fan coupled with adequate soffit venting will ensure proper attic ventilation. Don’t Postpone Your Repairs Till Spring! The integrity of your roof is critical in maintaining your home’s value. Proper maintenance and inspections, especially before winter snow storms, can significantly extend the life of your roof. Protect your home by scheduling a roofing & gutters inspection/maintenance today! Call 302-725-ROOF (7663) in Delaware or 610-551-ROOF (7663) in Pennsylvania or request a Free Quote online! Don’t forget to ask about our discount of 15% off any roof repair job!!! When a hurricane or other violent seasonal storm hits, your roof is one of the areas of your home that’s most likely to be damaged. Because roof problems can quickly lead to other, potentially more serious internal and structural issues, it’s important to be proactive about preventing hurricane and storm damage. This is especially true if your roof is older and already susceptible to leaks. The good news is that it’s fairly easy to prepare your roof for hurricane season, even if you don’t have a lot of DIY experience. With some simple repairs and basic reinforcements, your roof will stand a much better chance of holding up if a hurricane or major storm strikes. The standard asphalt shingles on the market today are generally able to withstand wind speeds of up to 150 miles per hour, and products with even more robust wind resistance capabilities are available. Take advantage of these technological and material improvements, and replace any worn-down, loose or damaged shingles with wind-resistant new ones. All newly installed and loose but otherwise sound shingles should be treated with high-performance roofing adhesives. This adds a vital second level of protection against high winds, helping your shingles stay in place. Adding a roofing reinforcement is a more involved project, but It’s one that may well be worth the effort…and could even save your life in an extreme situation. Overlapping two-by-four lengths of wood across your roof trusses is the standard way to reinforce a roof. If you’re planning to do this yourself, be sure to leave about a foot and a half of space between each row of two-by-fours. Perform a careful check of all areas where your roof converges with the walls and ceilings of your home. If you find any cracks or gaps, close them off with a water-resistant sealant to prevent leaks and other forms of storm damage. Finally, perform a check of all your roof gutters and downspouts. First, make sure that they are not clogged with debris like loose sticks, rocks, dirt, or decaying leaves. Clear out any such debris immediately. Second, test your downspouts to make sure they are properly redirecting water off your roof and away from your house. Malfunctioning downspouts pose hazards not only to your roof, but also to your basement, as rainwater accumulation can result in flooding. If you have any questions or concerns about preparing your roof for the hurricane season, or you’ve already experienced wind or hail damage and need help dealing with the aftermath, contact All Roofing Solutions for assistance. Professional guidance is always a superior substitute for guesswork. Call 302-725-ROOF (7663) in Delaware or 610-551-ROOF (7663) in Pennsylvania to schedule your roofing inspection today! If you have an older roof or think your roof may be in need of repairs, contact us before more serious problems occur. The truth is, regular roof inspections can delay, and often prevent, expensive roof replacements, whether the damage is from high wind or other inclement weather. Whatever your roofing needs are, we’re here to help. Family owned and operated, we are a local roofing contractor with 20 years of experience in residential & commercial roofing servicing Delaware and South-East Pennsylvania. Our team of skilled contractors is familiar with a myriad of roofing issues. We will check your roof for potential problems, answer your questions, and get the job done right! Attic ventilation offers year-round benefits that help homeowners save energy & prevent problems. Attic ventilation check is a critical part of fall roofing maintenance. Proper attic ventilation is critical in controlling moisture/heat buildup in an attic space – and preventing winter roofing issues such as ice dams and structural damage due to pooling water and ice build up. During the summer, adequate ventilation can help prevent heat from building up inside the home’s upper reaches, where warm air tends to collect and stagnate. In the winter, attic ventilation helps prevent excessive indoor moisture and humidity, helping guard against potential problems like mildew and mold. Specific to roofing, it’s also important to remember that some shingle manufacturers list suitable attic ventilation as a warranty requirement, so it’s especially important to perform a thorough check in advance of any roof upgrades. Does the system follow the principles of balance? Exhaust vents, located near roof ridges, and the intake vents near the soffits need to be balanced one-for-one. Many homes have inadequate intake venting, a problem best relieved by adding continuous intake vents. Are the vent holes properly sized? It isn’t enough to simply balance the number of vents; they also need to have holes that facilitate adequate airflow relative to the size of the space being ventilated. Does the system feature insulation baffles? Baffles prevent soffit vents from getting blocked off, which essentially renders them inoperable. Is there any evidence of moisture problems? Warped or degraded wooden framing and the presence of mold and/or mildew indicate problems with excess humidity, which itself is a sign that the ventilation system isn’t performing the way it should. Are the vents free of obstructions? Over time, leaves, dirt and other debris can clog vents, limiting or even eliminating their efficiency. They also get painted over sometimes, a problem that should be remedied immediately if detected. Do all vents use the same system? There are various attic ventilation systems, including gable louvers, power vents and others. These systems can’t be mixed and matched in a single home; all vents should use a single system to ensure operational viability. Are there cathedral ceilings? If so, you’ll need to take a different approach to inspection, physically checking for signs of moisture penetration like cracked or chipped paint, stains and evidence of condensation, mildew and/or mold. Does the vent meet code standards? There are two main types of code requirements: 1/300 and 1/150. Consult the International Building Code (2000) for specifics on how to calculate the standards to achieve specific airflow rates, guided by the principle that 1/150 ventilation is needed if the attic has no vapor inhibitor or has an uncorrectable imbalance, and 1/300 ventilation is needed if it does, or if the system is already balanced. If you’re unsure whether or not you have adequate attic ventilation, consult a professional roofing contractor. Achieving proper ventilation can be a technical undertaking, so you’ll need to eliminate any possible guesswork from the equation to achieve optimal results. A small investment today can save you thousands of dollars down the road in unnecessary repairs, not to mention hours of inconvenience. If you want a healthy and efficient roof system, you need to find a quality installer who won’t cut corners. Contact All Roofing Solutions, a local Delaware roofing contractor with a team of skilled, loyal and hardworking crewmen. We serve customers throughout Delaware and southeastern Pennsylvania, and are happy to check the integrity of your attic ventilation or handle any other roofing issues. Call 302-725-ROOF (7663) in Delaware or 610-551-ROOF (7663) in Pennsylvania to request your FREE ESTIMATE. Rain gutters represent an important piece of your home’s defense against the elements. During a rainstorm, your home’s gutters handle the runoff from the entire roofing surface and drain it away from the home – a significant job indeed. Gutter maintenance is critical to the longevity of the roof. The gutter system, in coordination with your roofing, protects your home’s siding, windows, doors, and foundation from water damage, and helps keep your basement from flooding. Clear leaves & debris. Gutters and downspouts must be clear of leaves and debris to do their job. Clogged, dammed drain outlets lead to overflowing gutters, and may even pull the gutters loose. Avoid clogged gutters from forming in the first place by installing a gutter guard protection system, or grab a ladder and clear your regular gutters from all the accumulated debris, before fall rains start. Evaluate the gutter angle, making sloping adjustments as necessary. Properly installed rain gutters are slightly sloped toward the downspout, allowing water to drain efficiently. Improperly sloped gutters will result in pooling, which over time will rot or corrode your gutters. An easy way to test the slope is by spraying water into the rain gutters with a hose (do this only after cleaning your gutters to avoid potentially clogging it and making things worse). The water should flow smoothly toward the downspout – if it doesn’t, you may need to fasten a diverter that will better control the flow. Additionally, improper location of downspouts, or not having enough of them, can lead to standing water and overflows during heavy rains. Inspect loose gutters or gutters pulled away from the structure. If water pools in your gutters for any reason, the weight of the water may, over time, loosen the fasteners and allow the gutter to pull away from your structure. Loose gutters can be fixed by installing fascia hanger brackets. To check the integrity of your gutter system, an annual inspection is recommended. Check for leaks and holes. Using a garden hose, spray water on your roof to see if your gutters are leaking. If you don’t have seamless gutters, your system may begin to leak at aging seams. Leaks started at those rusty spots may be repaired with silicone sealant. Be sure to seal both the inside and outside of the gutter. Small holes can be easily repaired with roofing cement, applied with a putty knife. Larger issues may require more serious repairs such as replacing the leaky section altogether. Inspect downspouts. Inspect your downspouts for any leaks or signs of excessive wear. If your downspouts are joined to fascia boards, ensure that they are firmly attached. For expert advice and an inspection of your home’s gutter system, contact the professionals at All Roofing Solutions. Family owned and operated Delaware and Pennsylvania roofing contractor with 20 years of experience in residential and commercial roofing, we have the experience and expertise to handle your gutter replacement & repair needs. After examining your gutters, we will offer you maintenance tips, quote required repairs or discuss your other needs! Protect your home by scheduling a roofing & gutters inspection/maintenance today – call 302-725-ROOF (7663) in Delaware or 610-551-ROOF (7663) in Pennsylvania or request a Free Quote online! 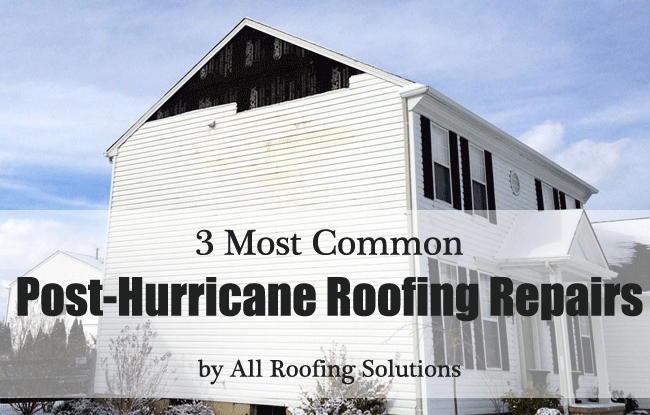 With the hurricane season fast approaching, we’d like to talk about the 3 most common roofing repairs we tend to run into after any substantial storm. From roof leaks and high wind damage to fallen trees and ripped off siding, the aftermath can be quite serious. Storms are dangerous and destructive. After a storm passes, a thorough inspection by a professional is critical – not all roofing problems are obvious, and the absence of leaks doesn’t necessarily mean your roof is fine. Make sure to check for roof damage from wind, hail or fallen branches, document any problems, and work with your insurance company and an experienced contractor to fix any issues. Here are 3 basic things to look for when checking your roof for any potential damage. High winds in general, and particularly high sustained wind typical for hurricanes, can be very difficult on your roof. If your asphalt shingles have been blown off or damaged by flying debris, your home is far more vulnerable to roof leaks and associated problems. Your roofer should examine each section of your roofing deck checking for missing shingles or missing pieces of metal fascia, including any chimney flashing pieces. They should also evaluate the condition of exhaust pipes, valleys, outer edges or angles where the roof meets the walls. And if there was any hail involved, check your roofing and siding for hail damage as well. Preventative Tip: Preventative inspection prior to the hurricane season can also uncover small issues before they turn into larger problems once your home is hit with high winds – inspect your structure as part of your fall maintenance routine and to avoid potential issues later! Hurricane’s hard, driving rain may exploit existing cracks or problem areas on your roof. It is critical to inspect your attic for leaks or water damage after the storm passes. Look for stains on ceiling or walls. Any water getting inside the house will damage the internal structure and can become a source of serious structural damage. Again, many leaks are hard to spot – the roofer your enlist should be experience in repairs or they might miss potential problems. If there are leaks, the most important step you can take to prevent any further damage to your roof and house is to control the spread of the water seeping in. Likewise, any puddles of water or stagnant water forming on the roof should be removed as soon as it’s safe to do so. If left unattended, this can be a major cause of roof leaks down the road. Preventative Tip: Again, a routine inspection every fall should be on your agenda, if you want to avoid costly repairs – especially if you own an older home or if your home is located in the path of the typical storm. Hurricanes stir up a lot of debris. Swirling twigs, branches, leaves, and building materials may not only damage your shingles, they may also clog your gutters, too. And, if debris remains on your roof, upcoming snow and rain is likely to wash it into your rain gutters. Malfunctioning downspouts pose hazards not only to your roof, but also to your basement, as rainwater accumulation can result in flooding. You’ll want to be sure your roof, gutters and downspouts are clear before water or ice backs up and causes damage. Remember, stay safe, and be sure to handle roof & gutter cleaning after the storm is completely out of your area, or hire professional help. Preventative Tip: Gutters clogging with leaves and debris is a common problem that can be prevented by installing gutter guards. When your home is bombarded by heavy rains, storm, strong winds or hail, prompt emergency repairs are often necessary. If you suspect your roof has been damaged or otherwise deteriorated, the best advice we can give you is to seek out the expertise and advice of an experienced, local roofing contractor. And All Roofing Solutions is ready to help! We’re a family-owned business with 20 years of experience and offer affordable, expert roof repair, replacement and installation services to customers throughout Delaware and southeastern Pennsylvania. Contact us today at 302-725-ROOF (7663) in Delaware or 610-551-ROOF (7663) in Pennsylvania for your FREE estimate. And if you mention this post, you’ll receive a discount of 15% off any roofing repair job.